To the left of the big house, most apparent is a white building with narrow pillars supporting an overhanging roof–it is either a shed or, more likely, an office. 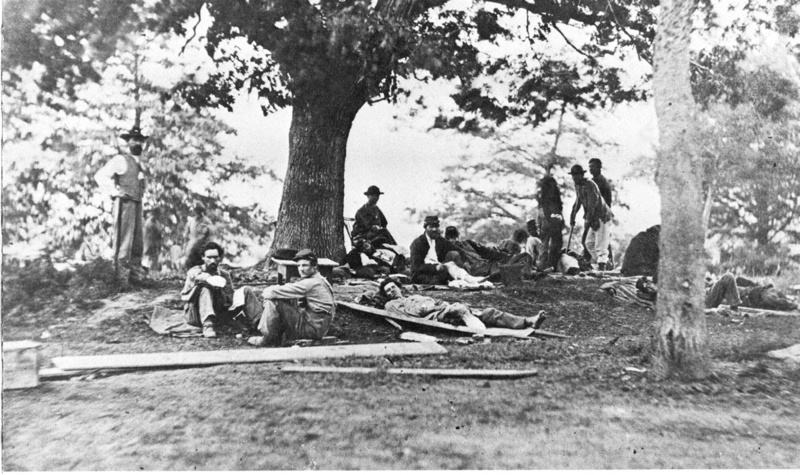 Here is the same building photographed a year later, in May 1864, medical officers lounging about while Brompton was being used as a Union hospital. 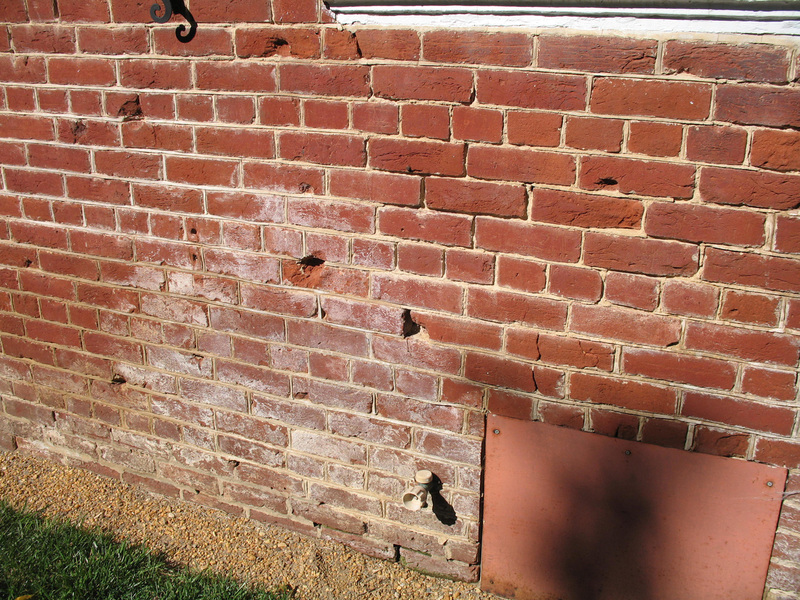 This building survives today, and indeed still bears many bullet holes, likely from the Second Battle of Fredericksburg. Curiously, you’ll note that the building’s door has been moved since the war–from the right side of the gable end to the left. 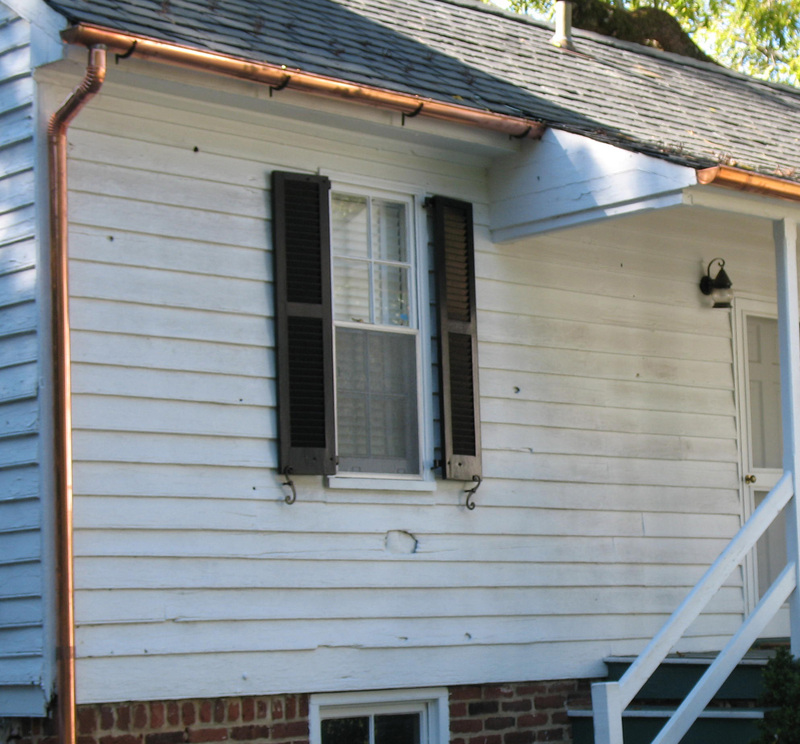 To the left of and below the farm office another building is visible–one a former owner described as a slave quarters. 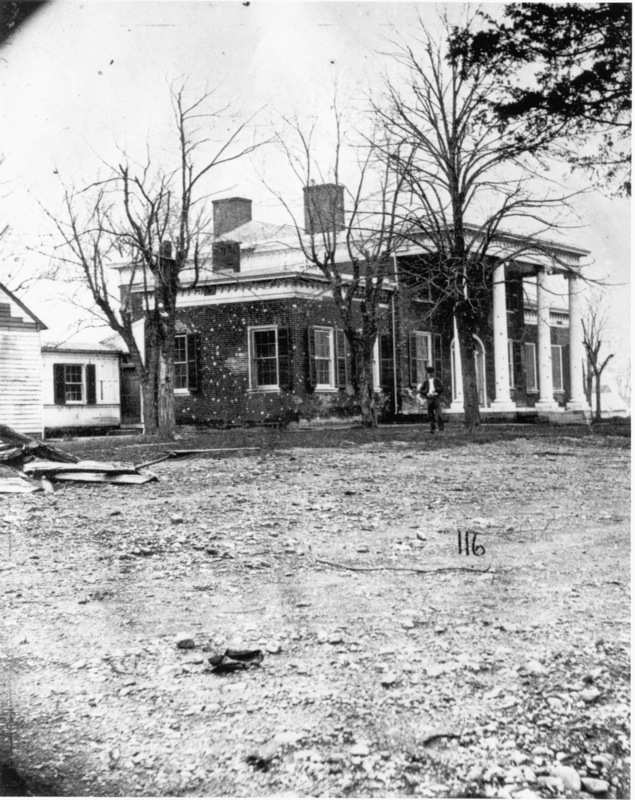 This building appears in the background of the 1864 image of the farm office, and, like the farm office, it too survives. 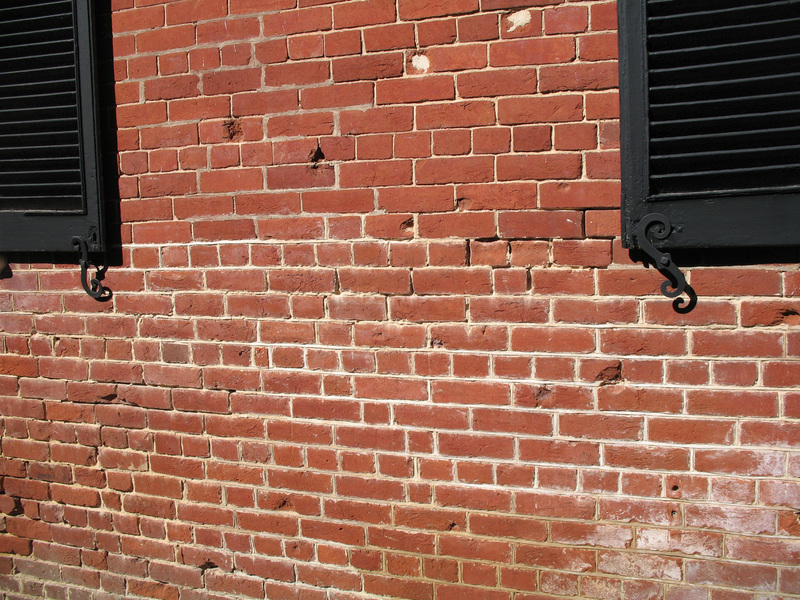 This building has more visible exterior battle damage than any building in the Fredericksburg area (so far as I know). Note especially the hole from an artillery shell beneath the left-hand window and the many bullet holes in the gable end. 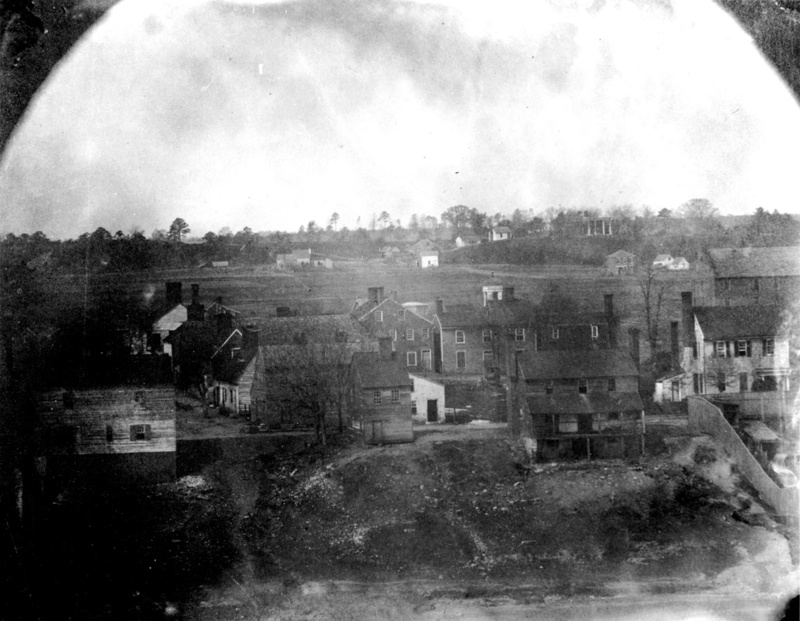 Again, most of these damage likely occurred at Second Fredericksburg. 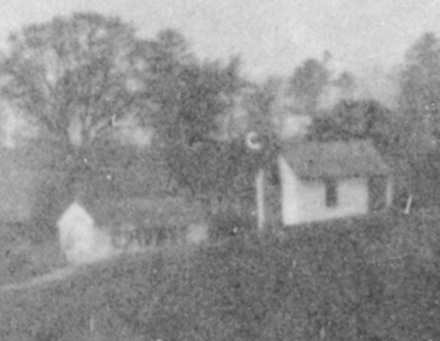 The other outbuildings visible in the panorama do not survive. 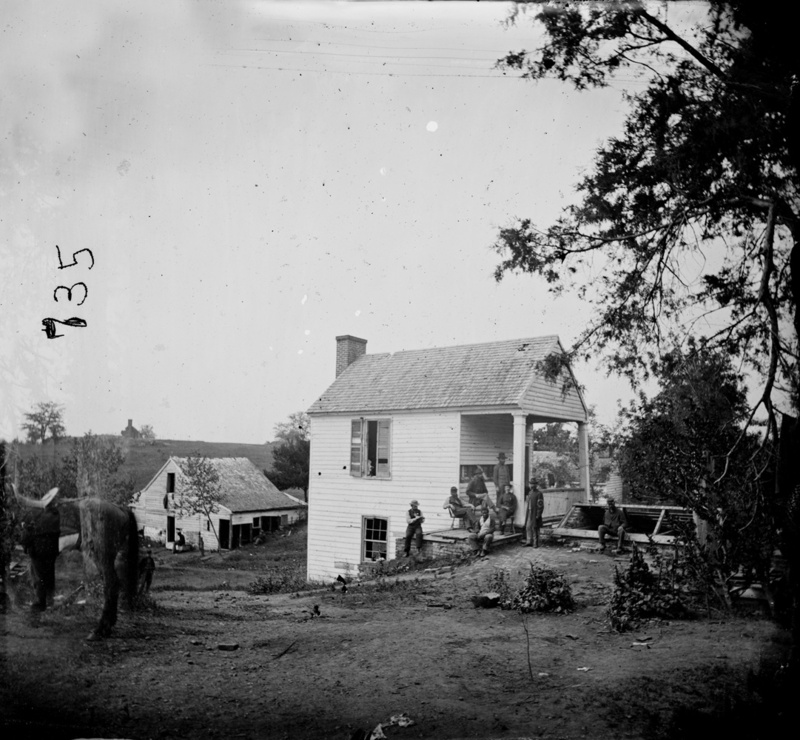 The barn faintly visible to the left of the slave quarters is likewise visible in in the background of the 1864 view of the farm office (it stands to the left of it). Likewise, the low, almost indistinguishable building that looms up in the panorama between the farm office and the big house is gone. 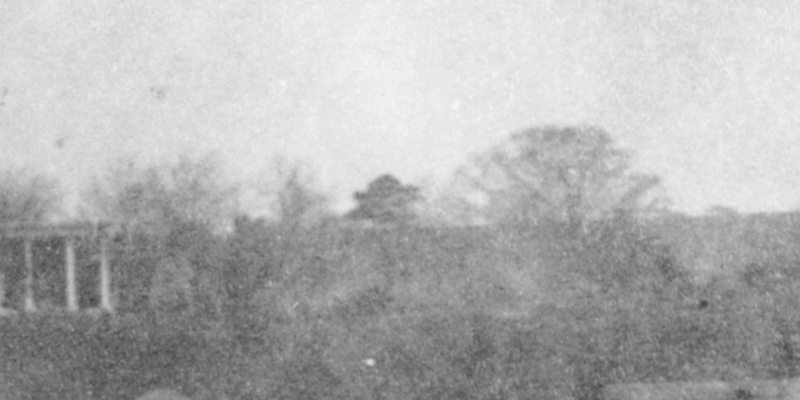 A wood-frame addition to Brompton–one that still stands to the left of the house–is obscured by trees in the panorama. You can see part of that structure in this historic view. As the modern view shows, it remains today. 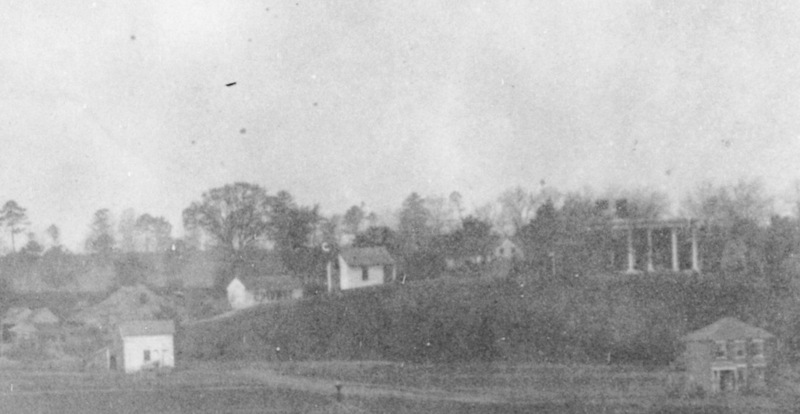 First, note that the frame addition to the left still stands (it is obscured by trees in the panorama). 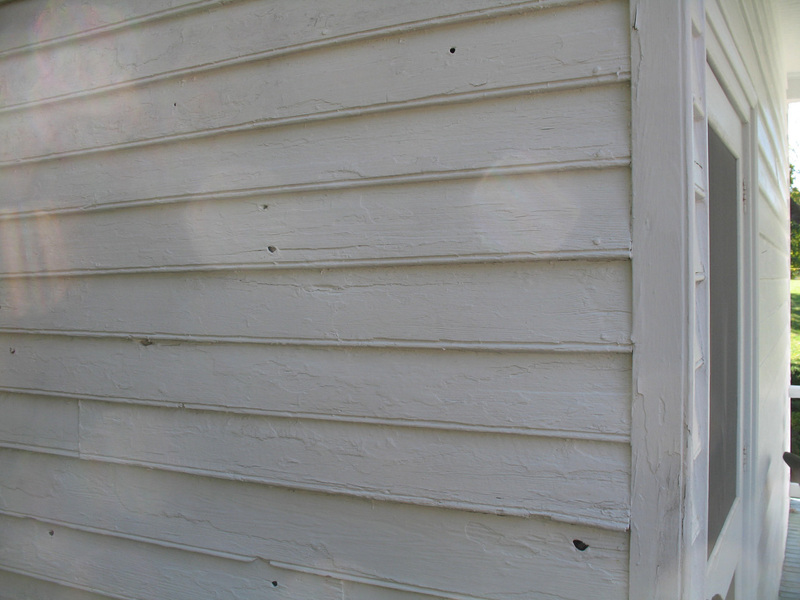 But more interestingly, look at the intense battle damage visible in the historic photo. 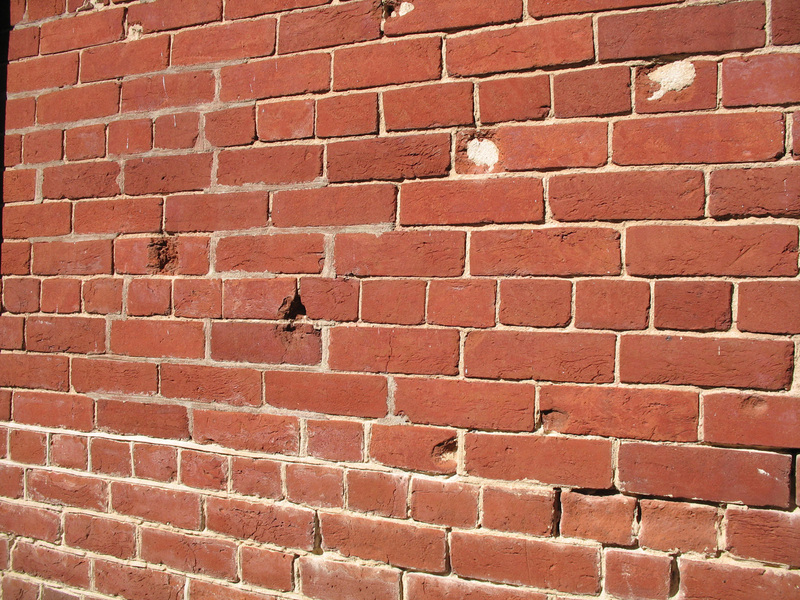 The south wall of Brompton is covered with the mark of bullets–the lead oxidized by a year of exposure. 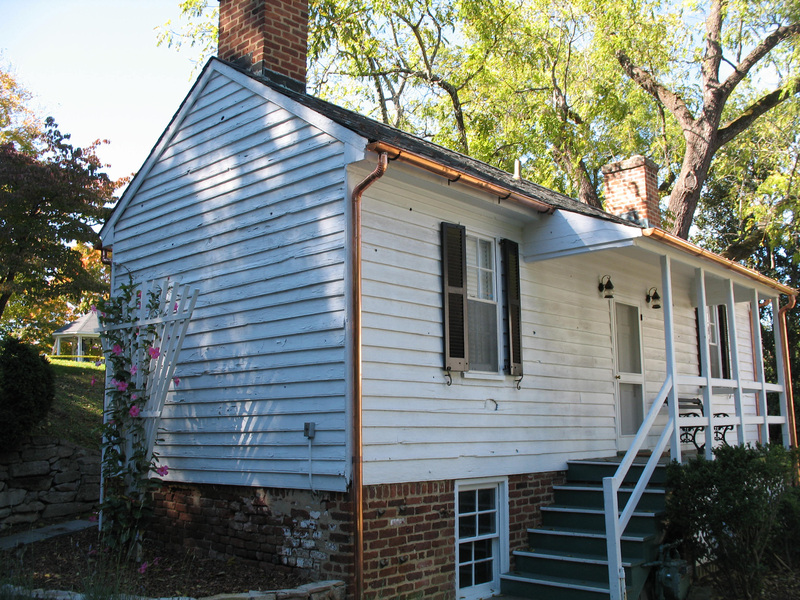 Today, the white oxidized mark of the lead is gone, but much evidence of battle damage remains in the bricks of the main house. 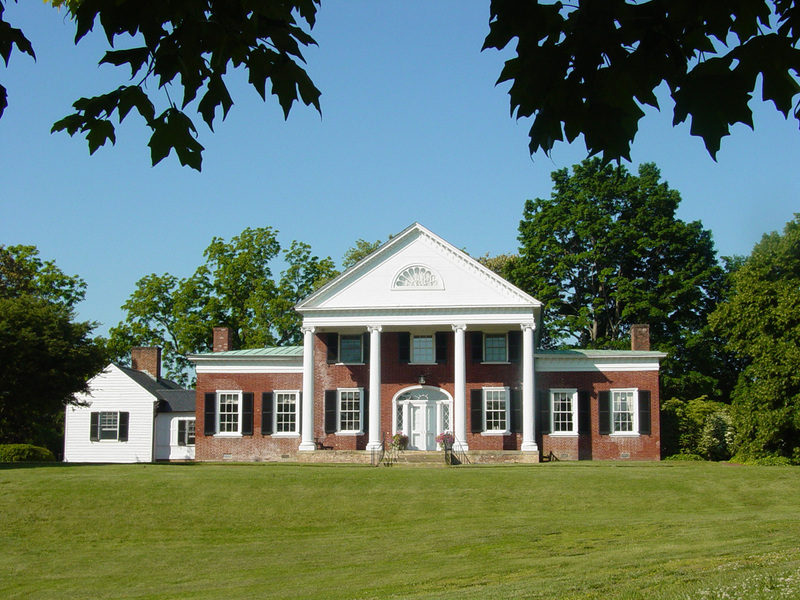 Finally, referring back to the panorama, note the huge, well-formed tree to the right of the main house. That’s the Brompton Oak, scene of some of the most famous images of the war, taken in 1864, and made famous in Bill Frassanito’s work. Since the 1940s, the University of Mary Washington has owned Brompton. While it is within the authorized boundary of the park, it’s hard to imagine that any president of the University would opt to live elsewhere (don’t blame them for that a bit). In the meantime, Brompton’s place in the historic landscape of Fredericksburg seems secure. It is stunningly beautiful–proof that the best thing for a house is to be lived in. 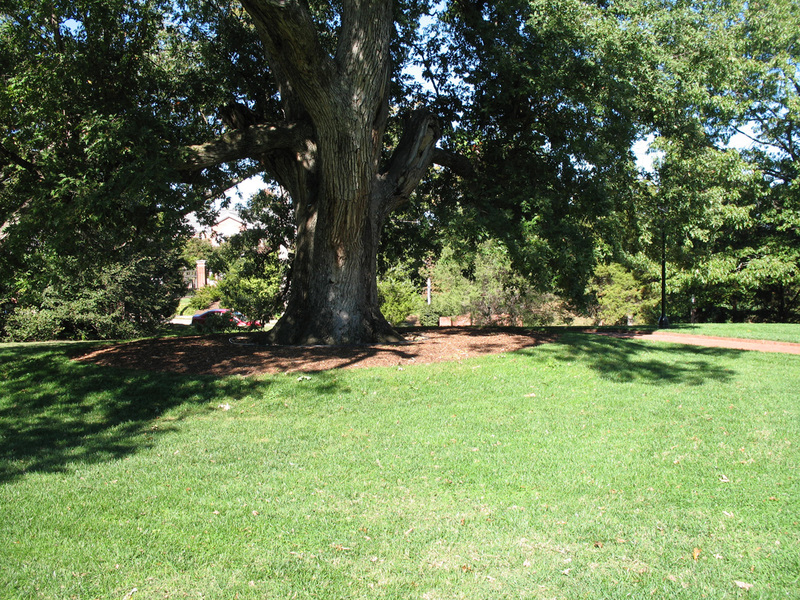 And we’re grateful to UMW President Rick Hurley and his staff for making its grounds available to the public on November 20. We hope you’ll join us and see the place for yourself. I greatly enjoyed this review of a very Historic site .